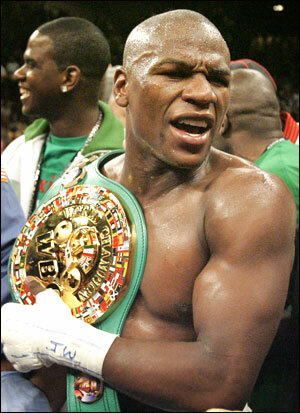 Floyd Mayweather Jr. has been barred from getting close to to his babies’ mama Josie Harris and their 2 children as a result of a domesetic violence incident in September 2010. Bail was set at $31,000 and Floyd must appear again at court in January. Josie claims the champion boxer beat her up, threatened to kill her, and stole her cell phone on September 9th. Why do we completely believe Josie Harris and NOT Oksana Grigevoria? The boxing champ was not present at the Clark County Courthouse in Las Vegas where the judge issued the ruling. As TMZ previously reported, Floyd’s baby mama Josie Harris claims the boxer beat her up, threatened to kill her and stole her cell phone on September 9.